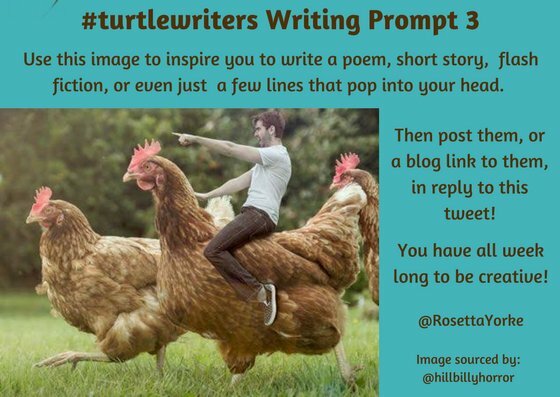 This must be one of the most bizarre ramblings I have written but the prompt below popped up on Twitter via #turtlewriters so here goes. YouTube made it look so easy when we watched it over a few pints at The Beehive. All we had to take a few cells from the dinosaurs DNA we had and insert it into the chicken eggs. Daily, we watched the clutch of eggs in the incubator Jack had nabbed from work. Waiting and waiting. Day 21, there was movement as a couple of the eggs wobbled. Anticipation filled the air. This was it. This was our key to being millionaires. We were going to be famous. A crack appeared. Then another. We all inhaled deeply and held our breath and out came – a BLOODY chicken! Where was the clutch of miniature triceratops we were expecting? Simon, the nerd and brainchild of the project just shrugged his shoulders before downing his pint. That said we are still rich and famous. After all no one can resist taking part in the Chicken Derby on a Sunday afternoon.